Carriage doors that swing out to open! Evergreen Carriage Doors® custom crafts sliding barn doors and carriage doors that hinge at the side and swing out to open. 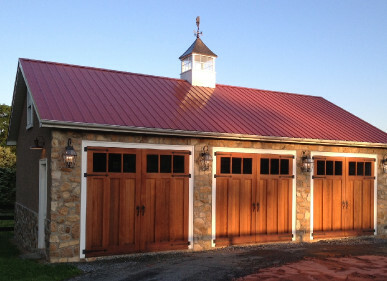 Whether you're replacing old barn doors, antique carriage doors, adding on to a classic home, converting your garage to living space, or building a new garage, call Evergreen Carriage Doors® at 800-654-0750 for a free price quote. Or if you prefer, contact us now to request information. Ask about our automatic door opener systems for side hinged carriage garage doors. 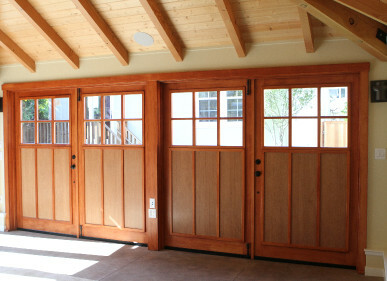 You can have the convenience of remote operation, AND the beauty of authentic wood carriage doors. The door of your home, garage or carriage house tells something about you. A good door beckons, shelters, and welcomes. It is a dramatic statement about the hospitality, strength and character of those who dwell within. If your home has a traditional period style, it belongs to the era in which it was created. 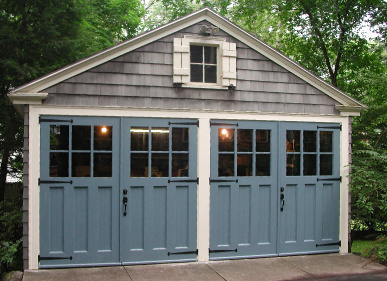 You honor that heritage by choosing a carriage garage door with style and character. If your home was built with its garage oriented forward, toward the street, and it is equipped with an ordinary garage door, Evergreen Carriage Doors® can provide a dramatically improved classic look with our swing out carriage doors.